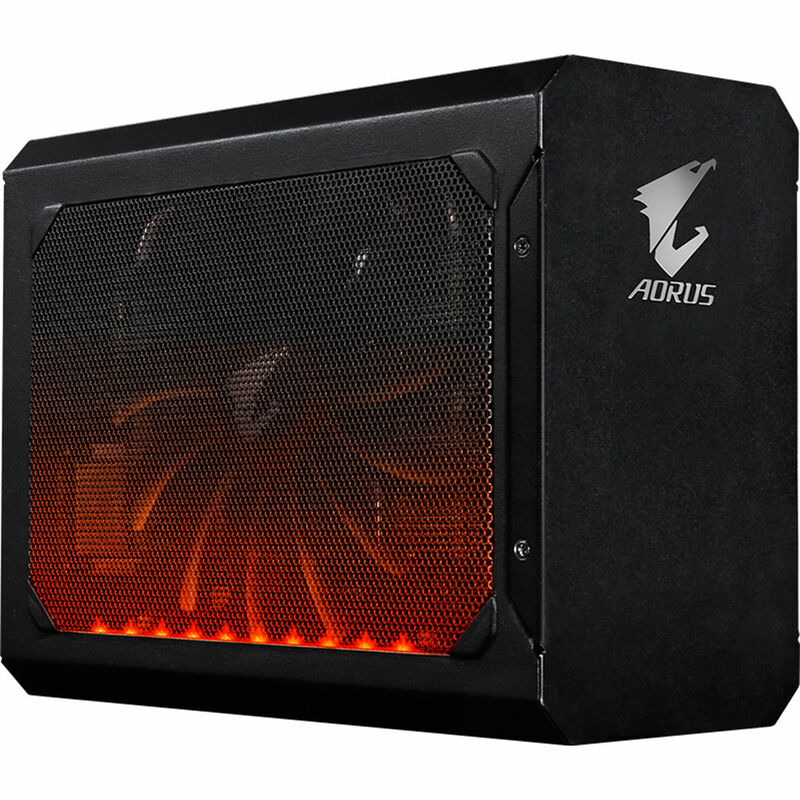 The AORUS GTX 1080 Gaming Box from Gigabyte is an external GeForce GTX 1080 graphics card with 8GB of GDDR5X memory that can help turn your compatible Thunderbolt 3-equipped Windows 10 desktop or notebook into a gaming platform. The AORUS delivers the performance necessary for graphics-intensive and VR-ready games with respective base and boost speeds of 1607 and 1733 MHz in gaming mode, 1632 and 1771 MHz in OC mode, a memory clock of 10,010 MHz, and 2560 CUDA cores. The AORUS GTX 1080 Gaming Box connects to your host system using its Thunderbolt 3 port, which not only delivers speeds up to 40 Gb/s, but also delivers up to 100W of power for charging notebooks via Power Delivery (PD) 3.0. Video is output to up to four displays at a maximum resolution of 7680 x 4320 using using one HDMI, three DisplayPort, and one Dual-Link DVI-D output, and three USB 3.0 Type-A ports allow for users to connect peripherals such as keyboards, mice, headsets, USB storage, LAN adapters, and more. Additionally, a Quick Charge (QC) 3.0 port charges devices faster than conventional charging, provided they are compatible with QC 3.0. Please note that this port is only for power charging. This external GPU operates using an internal 450W power supply that runs at 100-240V and 50-60 Hz. Included is a Thunderbolt 3 cable, a power cord, and a carry bag. Protection is provided by a limited 3-year warranty. 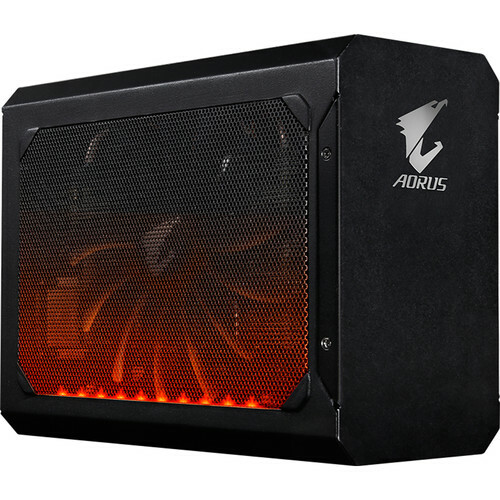 The AORUS GTX 1080 Gaming Box connects to your Windows 10 desktop or notebook using Thunderbolt3, which provides data transfer speeds up to 40 Gb/s and delivers 100W to charge your compatible notebook, provided it supports Power Delivery (PD) 3.0. The AORUS GTX 1080 Gaming Box provides one HDMI, three DisplayPort, and one Dual-Link DVI-D for external monitor outputs. Resolutions are supported up to 7680 x 4320 and up to four displays may be utilized via multi-view. The AORUS GTX 1080 Gaming Box provides three USB Type-A ports to connect a mouse, keyboard, headset, USB storage, or most other USB devices. Or, use a USB to Ethernet LAN Adapter to take advantage of wired networks. A fourth USB Type-A port is designed strictly for power charging and support Quick Charge (QC) 3.0, which charges compatible devices faster than conventional charging. Please note that your device must support QC 3.0. With 16.7 million customizable color options and numerous lighting effects, you can choose the right scheme for your gaming rig through the AORUS Graphics Engine. Lighting effect modes include Cycling, Consistent, Flash, Dual Flash, and Breathing. With its compact design, the AORUS GTX Gaming Box is suitable for most desktops and easy to carry if you're traveling with your notebook system. Box Dimensions (LxWxH) 11.5 x 10.5 x 6.25"
AORUS GTX 1080 Gaming Box is rated 3.0 out of 5 by 2. Is this gaming box in brand new or used condition?